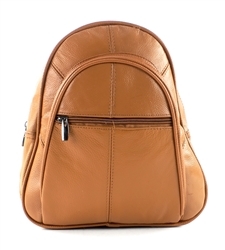 This small leather backpack was designed for the traveler. This massive backpack, made with genuine cowhide leather and quality hair on hide, has a spacious main compartment with a twist snap closure and interior zippered pocket. On the backside, there is a handle, adjustable shoulder straps, and two zippered pockets. This massive backpack, made with genuine cowhide leather and quality hair on hide, has a spacious main compartment with a twist snap closure and interior zippered pocket. On the backside, there is a handle, adjustable shoulder straps, and two zippered pockets.